According to Joe 'exploding head' Romm, the Antarctic Peninsula meltdown to China is now "non-linear, fastest in 1000 years!" However, a paper published today in The Cryosphere paints an entirely different picture. The paper examines the surface energy budget on the two major Larsen & Wilkins ice shelves in the Antarctic Peninsula over the past 21 years from 1989-2010. 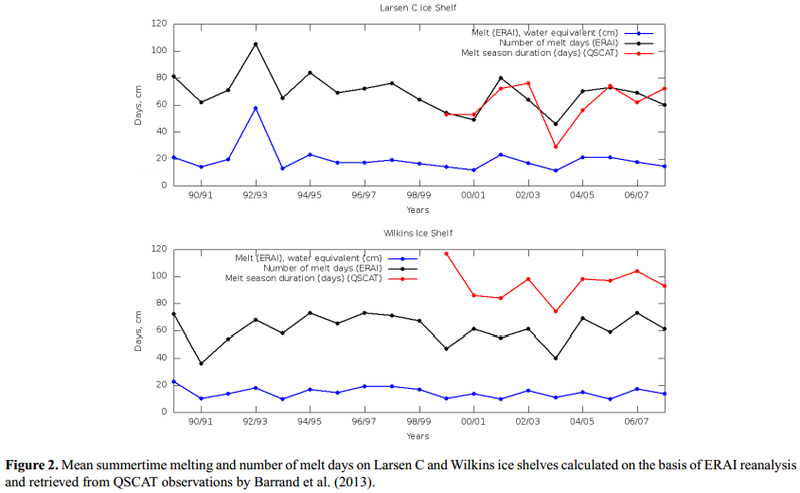 According to the authors, "the automated weather station observations on the Larsen Ice Shelf did not show any significant temperature trend, and the reanalyses [of temperature data] showed warming trends only over the Wilkins Ice Shelf." However, the authors find a large upward biases in the reanalyzed data, stating, "Focusing on biases of seasonal means, our validation results include three interesting issues: (1) all three reanalyses had warm temperature biases in all seasons..." Thus, it isn't clear how much, if any, of the warming of the Wilkins Ice Shelf is real vs. due to biases in the reanalyses, and meanwhile direct weather station observations of the Larsen Ice Shelf show no warming over the past 21 years. The paper attributes the possible warming of the Wilkins Ice Shelf to natural changes in atmospheric pressure, wind, and cloud fraction, but not longwave radiation from the steady increase in greenhouse gases. Why? Because the authors paradoxically find that net longwave radiation from greenhouse gases has decreased over the past 21 years, rather than increased from the steady rise of greenhouse gases as predicted by AGW theory. This is shown in the following tables where LW = net longwave radiation from greenhouse gases at the surface of the Antarctic Peninsula, SW = net shortwave radiation from the Sun, Ann = Annual. There are statistically significant negative trends in net longwave radiation on both ice shelves, not positive as would be expected from the steady rise of well-mixed greenhouse gases. Another paper has also found a paradoxical decrease of longwave radiation from greenhouse gases over the past 14 years in the US Great Plains. The authors also note that monthly mean temperatures only rose above the freezing point twice over the past 21 years, during the summers of 1989–1990 and 1994–1995. "Unfortunately the Larsen C AWS was out of commissionin summer 1992–1993, and thus could not be used for confirmingthe peaking of melt during that summer. During summers1989–1990 and 1994–1995, which are identifiable bythe high number of melt days on LCIS, the monthly meantemperature was above 0 C during one summer month accordingto the AWS. Monthly mean temperatures did not riseabove freezing point during any other period between 1989and 2010. According to the AWS data, summer 2002–2003,which experienced a large melt, was not distinctly warmerthan other summers." Abstract. Ice shelves in the Antarctic Peninsula have significantly disintegrated during recent decades. To better understand the atmospheric contribution in the process, we have analysed the inter-annual variations in radiative and turbulent surface fluxes and weather conditions over Larsen C Ice Shelf (LCIS) and Wilkins Ice Shelf (WIS) in the Antarctic Peninsula in 1989–2010. Three atmospheric reanalyses were applied: ERA-Interim by ECMWF, Climate Forecast System Reanalysis (CFSR) by NCEP, and JRA-25/JCDAS by the Japan Meteorological Agency. In addition, in situ observations from an automatic weather station (AWS) on LCIS were applied, mainly for validation of the reanalyses. 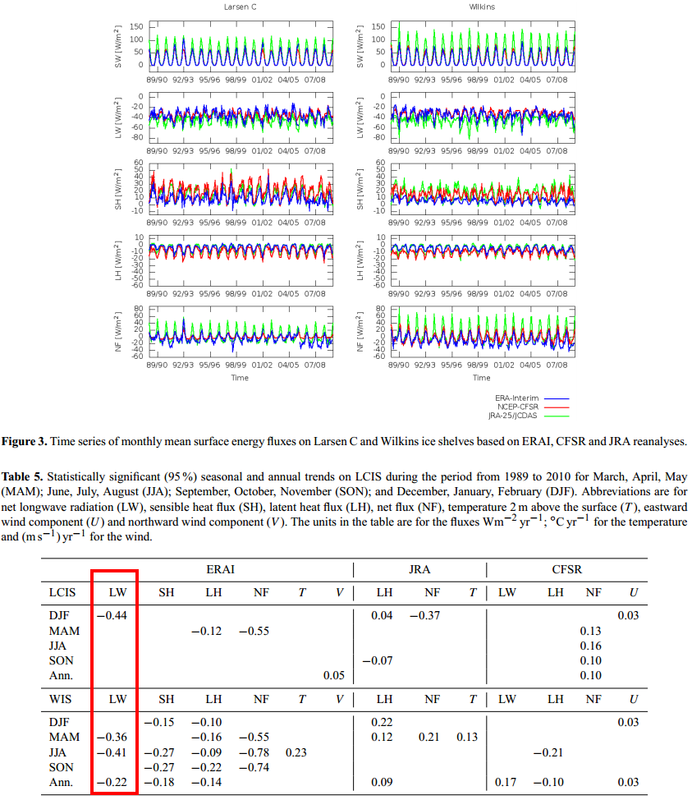 The AWS observations on LCIS did not show any significant temperature trend, and the reanalyses showed warming trends only over WIS: ERA-Interim in winter (0.23 °C yr−1) and JRA-25/JCDAS in autumn (0.13 °C yr−1). In LCIS from December through August and in WIS from March through August, the variations of surface net flux were partly explained by the combined effects of atmospheric pressure, wind and cloud fraction. The explained variance was much higher in LCIS (up to 80%) than in WIS (26–27%). Summer melting on LCIS varied between 11 and 58 cm water equivalent (w.e. ), which is comparable to previous results. The mean amount of melt days per summer on LCIS was 69. The high values of melting in summer 2001–2002 presented in previous studies on the basis of simple calculations were not supported by our study. Instead, our calculations based on ERA-Interim yielded strongest melting in summer 1992–1993 on both ice shelves. On WIS the summer melting ranged between 10 and 23 cm w.e., and the peak values coincided with the largest disintegrations of the ice shelf. The amount of melt on WIS may, however, be underestimated by ERA-Interim, as previously published satellite observations suggest that it suffers from a significant bias over WIS.